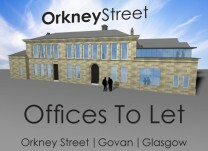 With a variety of office space ranging from 800 to 2000 sqft in size, as well as unique 200 sq ft, serviced space for small and fledgling business in its converted prison block, Orkney Street Enterprise Centre could be the ideal home for your business. Located close to the M8 and M77, and well served by local bus routes and Govan Subway, you’ll find it meets all your needs. “The cells are a great starting point for a business. It is great value and provides furniture, IT equipment, reception services, access to photocopying and mail facilities – basically everything you need to start your business” John MacLean, Editor Govan Press, located in OSEC.